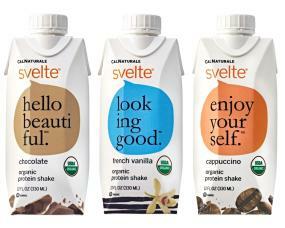 View larger CalNaturale Svelte Organic Protein Shakes: Real, all-natural ingredients. Made in California! CalNaturale Svelte Organic Protein Shakes are premium, multi-functional, protein drinks providing great taste, positive nutrition, and increased vitality through pure and simple, certified organic ingredients. CalNaturale Svelte drinks are also non-dairy (vegan), cholesterol-free, certified gluten-free and certified kosher. They are great as a healthy and delicious meal replacement option, pre & post-workout, or as an anytime on-the-go snack. Each rich, creamy flavor helps to control hunger, keeps you going, and gives you natural goodness through important nutrients including: 1) Provides 20% daily value of protein from USDA certified organic, fresh soymilk made in our plant, 2) 5g or 20% daily value of fiber from organic inulin, 3)Sustained energy from an organic complex carbohydrate, organic brown rice syrup solid and inulin, and 4) a premium vitamin & mineral blend: including antioxidants A & E, D2, B12, B2, Calcium & Zinc. Svelte also qualifies as a low glycemic product with a low sugar profile. CalNaturale is part of California Natural Products (CNP), a leading natural foods company with a 30+ year history of innovation and excellence in natural and organic food and beverages. We started back in 1980 with five employees and a commitment to creating nothing but the best-tasting, convenient foods at a great value, without compromising on quality or the environment. Since then, we’ve grown to over 400 strong, developing many of the industry’s iconic and best-loved products. CNP manufactures its products using millions of pounds of locally CA grown, certified organic rice, fruits and vegetables each year, proudly supporting direct sourcing from Local Farmers. We purchase these local agricultural commodities and others, including organic soy, direct from over 45 proud American farmers, supporting 6,000 acres of US organic farmland. We also purchase tropical ingredients, such as coffee, cocoa, tea and spices directly from over 25 international farms. Svelte is also produced in an award winning facility for environmental stewardship (waste reduction, water recycling, forest sustainability, etc). It is packaged in recyclable Tetra Prisma containers providing consumers with one of the leading sustainable options for beverages!